Sacramento is an amazing city, with so much to see and do. There's sights to see, amazing bars and restaurants to visit, and many great establishments to enjoy. So throwing a bachelorette party in Sacramento is always exciting! The only hard part to the planning process is narrowing down where you'll go! And with the new trends for bachelorette parties, there's a whole new world of possibilities! 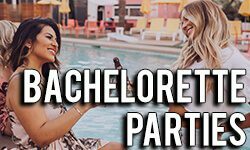 When you first think of a bachelorette party, you might picture pink drinks, a wild girls night, and lots of bar hopping - and this is definitely a popular way to celebrate! If you choose this wild and crazy option, a party bus or limo from Sacramento Limo Bus is a great choice because not only can you drink and dance on the buses, you'll enjoy a luxurious ride where all your friends can travel together and you can feel good knowing you have a safe and reliable mode of transportation. However, are services are ideal for several other party themes as well! A big day of shopping? A limo offers ample space for your bags! Spa retreat? Complete the relaxing VIP experience with a limousine. Taking a pole dancing class? Test your new skills out with the pole on the bus! Traveling a far distance to a brand new trendy restaurant? Enjoy the ride in a party bus or limo. Whatever you decide on, a limousine or party bus is a great addition. We can drop you off at your weekend spa retreat in a limousine, we can take you all over Cali in a party bus - whatever you need, we truly can make the experience great. If you have any other unique bachelorette party ideas, call and let us know, we'd love to help you out with the travel!